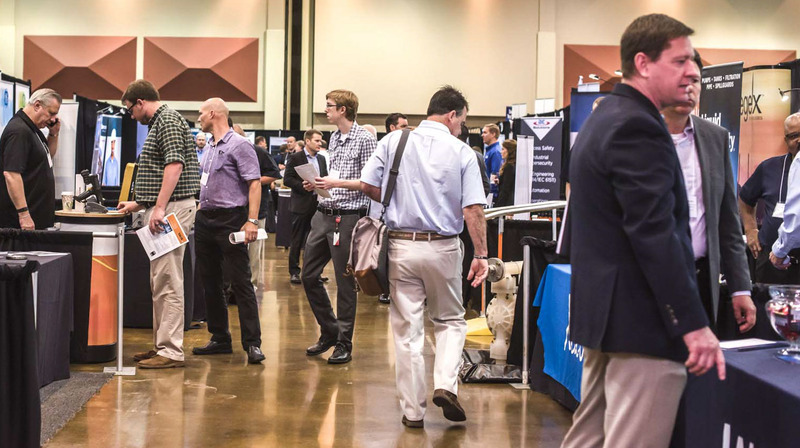 KINGSPORT, Tenn. (April 28, 2016) – A record turnout of almost 1,500 registrants, including exhibitors, packed the Meadowview Convention Center for the 9th eChem Expo, a combination of unequaled technical presentations and strikingly relevant vendor exhibits. eChem Expo looks like a trade show and conference but it’s so much more. It’s a highly relevant solutions marketplace based on extensive market research that reveals what engineering executives, technical managers and staff need to know right now and in the coming years. To find out what questions are crying out for answers, EcoChem Strategies – a company founded and led by chemical engineer and market analyst Peter Knox – conducted 70 interviews with potential attendees, 50 of them at Eastman Chemical Co. and 20 split between Nuclear Fuel Services and Wacker Polysilicon. capital effectiveness, plant lifecycle, modeling and simulation. The interviews also determined what vendors the organizers would invite to fill the booths of the exhibition floor. Instead of simply inviting past exhibitors to renew their commitment to the gathering, the organizers invite the vendors that interviewees find relevant for the tasks they’re tackling now and in the future. More than 200 exhibitors qualified for space in the 2016 show. Themes for eChem Expo emerge during the interviews and help guide the process of choosing presentations and exhibitors. The overriding theme and related focus areas become a lens for interpreting the substance of the Expo. In 2016, the theme that shaped the conference was “Improving Innovation, Safety and Plant Reliability to Accelerate Manufacturing Growth.” Safety took on added importance at the Expo, compared with prior years, and became one of the focus areas for the first time. The five focus areas that helped guide presentations and exhibitions were safety and environment, capability enhancement, capital effectiveness, energy efficiency, and sustainable development. While assembling and evaluating the Expo, organizers also searched for innovations that lead to a “quantum leap” in any of the five focus areas. While acknowledging the importance of continuous improvement, the organizers emphasized that sometimes just a little more effort could bring the sudden, drastic transformation known as a “quantum leap”. Organizers also urged speakers and exhibitors to keep the future in mind when presenting their ideas, products and services. Challenges arise when preparing for the coming years with systems and equipment that have already logged decades of service. Exhibitors were chosen for eChem Expo because their products and services fill the needs revealed in 70 in-depth interviews with plant engineers. Those challenges have inspired every edition of eChem Expo since its founding by Knox Publishing in conjunction with Eastman Chemical Company in year 2000. As always, planning team members work long and hard to make the event a reality. For 2016, they included Eastman’s Gene Skates, John Barber, Cristina Kubicki Curtis, Jared Moore, Steve Smith, Ed Hicks, Bill Cook and Nuclear Fuel Services’s Tracy Coates. The Executive Sponsors who provided leadership support and theme development included Eastman’s Parker Smith, Jan Shumate, Tina Davis; Nuclear Fuel Service’s Ron Dailey; and Wacker Polysilicon’s Thomas Kastenberger. Event organizers have been striving to make eChem Expo the “#1 multidisciplinary applied innovation gathering in the process industry” and may very well have achieved this in 2016. First time attendee numbers and multidisciplinary participation were at record highs; expo attendance and the number of exhibiting companies were both up by 30%; 53 PDH accredited seminars; and overall seminar participation increased by an astounding 80%! Electrical engineers were among the newest group of multidisciplinary participants to find relevance in eChem Expo; joining with their counterparts in chemical, mechanical, instrumentation, plant engineering, operations, maintenance, procurement, and multiple other disciplines for a day of sharing ideas, experience and expertise. 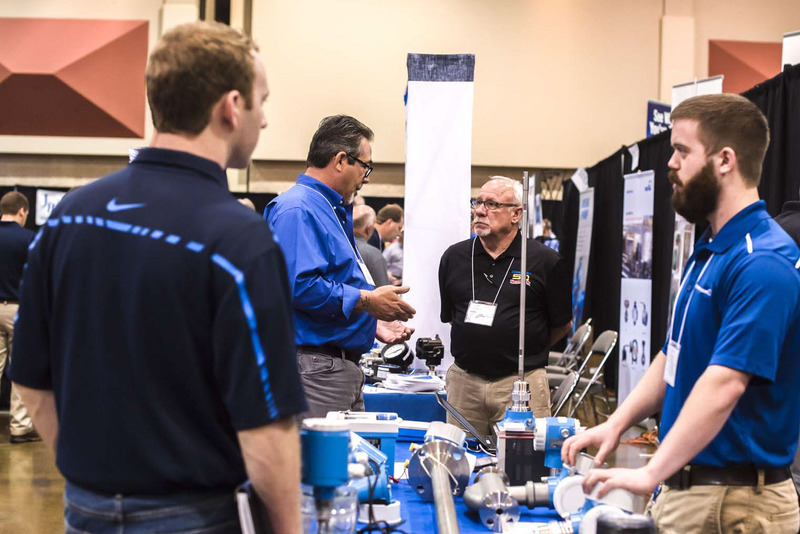 Attendees thronged the exhibit floor to examine equipment, gather information and build working relationships. 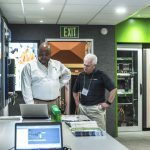 More than 200 vendors presented products and services. Attendee feedback surveys give high marks to the overall gathering and support for the launch of a new e-publication focused on innovations presented at eChem Expo. As such, “APPLIED INNOVATION … powered by eChem Expo” is being e-published as the inaugural Summer 2016 Edition. In addition to reading “APPLIED INNOVATION … powered by eChem Expo”, attendees and those who missed the April 28, 2016 gathering can view the eChem “2016 Web Marketplace” where readers can easily view the websites and product innovations of most of the companies who exhibited in 2016. Here’s the link: eChem 2016 Web Marketplace. eChem Expo is held every two years in Kingsport, TN. Organizers have selected April 5, 2018 for the next gathering at the Meadowview Convention Center in Kingsport, TN. Final date selection will be confirmed 9 months prior to the event.